Her skin is the color of blood soaked soil; deep, earthy brown with a sheen of red, but broken by a mottled mixture of bone ivory appaloosa and pinto markings. The blanket of her appaloosa stretches from her shoulders, across her back and ribs, and covering her hips to her thighs. It’s edges are jagged and broken like shattered glass, with sharp points and gaping holes. Pinto marks three of her legs in alabaster, stretching up her chest and narrowing to a thing strip at her throat before spreading to cover her muzzle, eyes and ears. Vendetta’s belly, neck, cheeks, forehead and rear left leg remain dark and undisturbed, and on her right foreleg there is a patch of black chestnut left at her fetlock. Vendetta has no mane or tail to speak of and instead she wears a fine, draping skirt that sits high on her croup, weighted so that it doesn’t fall even as it drags upon the ground. The skirt is bright, blood red like the roses she wears and the color of her eyes, and is feather light in texture. The hem is scalloped and white, with a bouquet of embroidered roses near the bottom. She also wears golden pearls entwined in the flowers, hanging from thin silver strands. 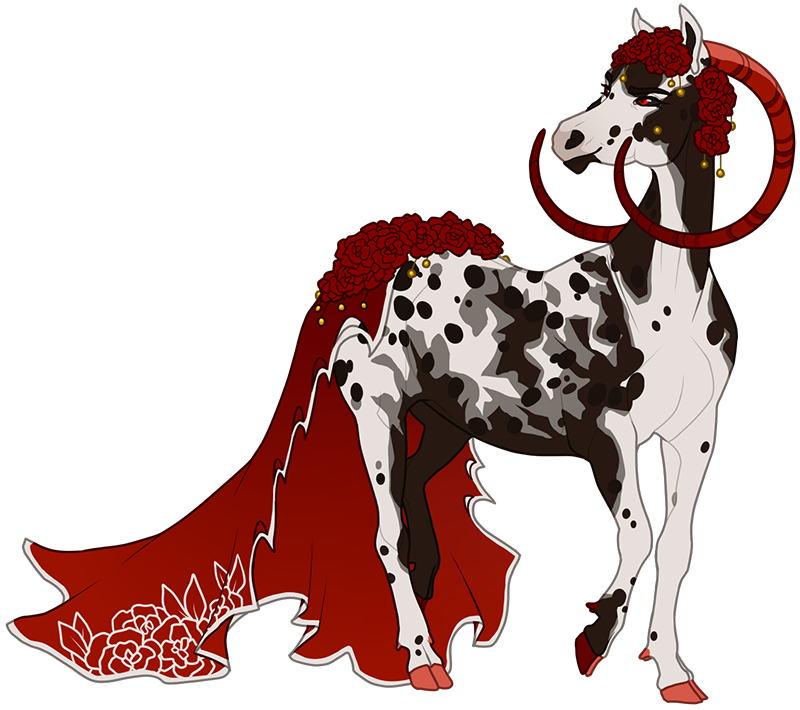 Her hooves are a deep dark red and a lighter, almost pink red, where they are touched by her pinto markings. The unicorn sports large but thin horns behind her ears that curl forward and then back up in a wide circle. Overall she is rather petite, not exactly small but slender and regal. Do not mistake her for being dainty or delicate, however, for the sharpness of her eyes is only second to a knife. For as beautiful as Vendetta may be, for as gracefully as she carries herself and as delicately built as she is, do not underestimate the sharpness of her eyes or the wicked quirk of her lips. Do not see the flowers and finery she wears and not look past it to what is cloaked underneath. Vendetta is as dangerous as any Solterran warrior, if not more so, but she hides it all behind a carefully crafted image. Vendetta is a businesswoman, this at least is not a cover. She is a very lucrative one at that, and seems to manage her hold over Solterra's blackmarket with ease. In fact, she seems to thrive as much in the spotlight as she does in the shadows, which is where many of her traits hide. The unicorn is cold, even to those within her circle, and trusts no one. In her line of work she expects anyone to turn on her as much as she might turn on them. Because of this Vendetta is incredibly vigilant and meticulous, and she has a great eye for detail. This also means that she often has no trouble tying up loose ends or covering her tracks. She is vindictive, incredibly so especially to those who she feels have wronged her, and remorseless of the lives she has ended or destroyed. Such a past time requires great control and secretiveness. There is little of herself or her life that she allows others to see or know of, and she prefers is that way. Very few have ever seen the cold fury that burns inside Vendetta, and those that have did not live to tell the tale. It is better to stay out of her way than to keep her interest, and of those she tolerates there are not many. Not all of Vendetta is as terrible as it seems, though every part of her only exists for power and profit. She is intelligent and picks up quickly on new ideas or skills. She is street smart, having lived on those very streets she now controls for years, and savvy. Very little is outside of her reach as she believes it. Her day to say weapon of choice is charm, which she wields with elegance and finesse. It helps her to get what she wants from whom she wants, while allowing them to feel some sort of confidence in themselves. On the surface she can be accommodating and even sociable, and as unlikely as it seems, Vendetta does have principles. Family is perhaps the most important thing to her, and she truly cares for them though she cannot speak to where hers is and none know they even exist. Fealty is another, to her and to others, for as long as it suits her needs. She has no qualms with cutting ties with those she finds to be unloyal to her causes, but her sense if loyalty, whole it exists, is strong. She is also not unlikely to give favors, assuming that those who would owe her can be used in some way to progress her own plans. Truly, even in the end, Vendetta is nothing more than a serpent in disguise. She was born Venera, beautiful and fiery and the love of her mother’s life. Ven was exposed early on to the dark truth of the life her mother had, though her master seemed to have taken a keen interest in the little filly he had fathered. Perhaps, she thought, it was only her existence that made her mother’s life bearable and his less violent, as the scars mottling her mother’s body were not so easily hidden. Perhaps, looking back, it was only because of her existence that her mother had kept her life at all. It took her too long to realize he’d grown tired of her mother and only kept the older woman around to subdue Ven’s fervor. It took her too long to realize she was being controlled, until the day she came of age and her mother was sold. There one day and gone the next, with no word of what had happened to her. Without her mother’s steadfast gentleness the young unicorn’s fire could not be tempered. She was unruly, reckless, a spitfire. For awhile her master seemed to tolerate it, if only because it amused him. Until one day his anger grew even hotter than her spirit. After that day she simmered, and she never once spoke of the events that had transpired. Though the fire in her never died out completely, Ven was considerably more subservient than she had ever been. Almost the perfect, obedient slave. A few short years passed before Ven became pregnant. She waited for feelings of happiness and joy to fill her, hoping it would give her back something she had lost when her mother had been taken, but they never did. Yet, when her child finally came into the world it was like nothing Ven had ever experienced. She felt an overwhelming urge to protect this little life that she’d made no matter the cost. She grew attached, and she never should have grown attached. When you care, it makes it easier for other to hurt you, and that is exactly what he did. The day her baby was weaned from her milk, he took the foal away and she had no idea what became of her child. It brought her back to the day he'd done the same with her mother and suddenly it was like a switch had been flipped. Ven did not burn hot but cold and fathomless. She burned with an icy hatred that would not let her sleep, would not let her eat. She was done with being controlled and in that moment she vowed to never let herself be manipulated again. If anyone was going to control the world it sure as hell was going to be her. He was her first kill, silently, swiftly in the middle of the night with a knife to his throat, and when she stepped past the threshold of the door she’d been locked behind for her whole life and onto the street a free woman, she was no longer Venera. She was reborn Vendetta and there was no love left in her heart, and no room for peace in her soul. Vendetta learned the rules of the harsh streets of Solterra quickly, her natural cunning and intellect allowing her some amount of an upper hand. She observed everything, missed little, and slowly began to collect power beneath her. She proved her superiority time and time again, building a name for herself among the black market, slowly amassing more authority, more control, more dominance. They called her The Pearl Mistress, and she wove pearls and roses together and wore them like a crown. She wanted to rule it all, and one day she would have it. So when Zolin died and the court erupted into chaos Vendetta took the chance it gave her, rising up from the shadows and inserting herself as the cornerstone of the black market trade in Solterra. She never had a true relationship with another until, one day she was walking through the very streets that she owned and saw a strange man selling a multitude of foreign, mythical beasts. One such creature was whom she discovered was Azrail, and she realized that he had been calling to her, drawing her to him. He was meant to be her bonded. The merchant, if you could call him such a thing, refused to sell Azrail to her for anything but an excessive amount of money, regardless of her claims. Feeling rather vexed, Vendetta did pay the man and her and Azrail, together, left. But she could not leave it at that. The unicorn tracked him down and later disposed of him, and though her bonded had no care for the man he did convince her to also free the other creatures he had chained and caged so that hopefully they would be owned by nobody again. With Azrail at her side, Vendetta continued to climb. She has carried a secret with her since that night she took the life of her former owner, however, and it is that she has time and time again drifted through doorways in the middle of the night and spilled the blood of the corrupt and perverted. More than one noble, especially those that still kept slaves, have fallen to her power and ruthlessness over the years. It is almost a sort of hobby, and one which she does with great care. Azrail is a phantom creature, a beast of shadows and nightmares. 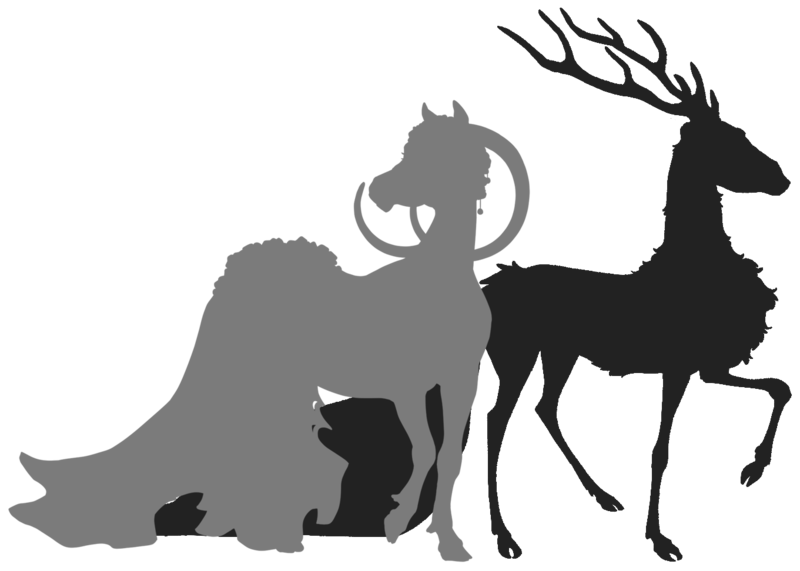 A looming shape, he measures roughly 5 feet at the shoulders, and with an impressive span of antlers appears even larger despite his rather thin and willowy frame. He could be described as gaunt, even, for his legs are long and stick thin and his body lithe but for the fluff of his chest and the great, feathered bulk of his tail. In color he is mostly raven black, though in certain lightly appears to have an otherworldly blue sheen to his fur and feathers. 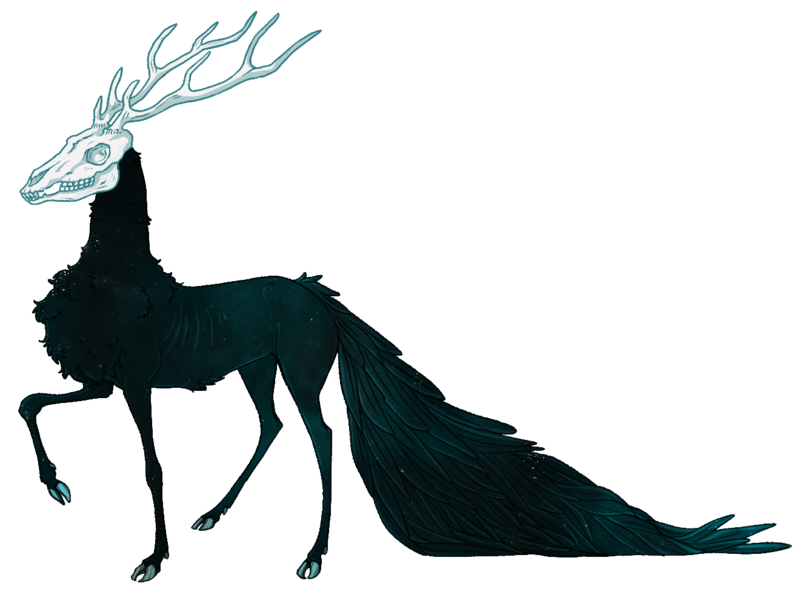 His hooves are steely blue and his skull and antlers as white as if they'd been bleached in the sun for many years. It is true that Azrail does not have eyes, and he cannot see, though many might think he can somehow see through Vendetta's own eyes. Instead, Azrail can sense the auras of the world around him, allowing him to navigate with ease. Truly he is an unsettling creature to be standing at Vendetta's side. As a persona, Azrail is often silent. Stoic, even, although he is perhaps the only one that Vendetta genuinely trusts and would consider his input. Even for his lack of sociability, he is quite knowing, and more of a humanitarian than Vendetta ever has been. His counsel is the majority of the reason that any have ever escaped her wrath, and he's convinced her to do more than one decent thing in their years together. For as disconcerting as his presence may be, it is probably in all's best interests that he is there. Don't be mistaken, however, for his loyalty lies with Vendetta alone, and he is incredibly defensive of and watchful over her. Their bond is unprecedented to any Vendetta has ever had before, even to her mother or the child she once birthed. They are one and always will be one. Vendetta wears her title with elegance and pride, flaunting the riches she has made with how she has choosen to adorn herself. She is dressed in a high quality chiffon-like skirt that sits high on her croup, weighted so that it doesn’t fall even as it drags upon the ground. It drapes down her hips and floats behind her as she walks, is bright ruby red in color and feather light in texture. The hem is scalloped, trimmed in white and even has small cutouts along it. Embroidered on both sides are several roses and leaves in the same pure white. Upon her head, like a crown, she wears brilliant red roses, the color of which matches her eyes, paired with golden pearls dangling from thin silver strands. This same adornment covers the weighted portion of her skirt where it rests over her flank.